Hollybeary Creations : NND Sept. Release Day 4. NND Sept. Release Day 4. Welcome to the final day of the September Release from Newton's Nook. All the products will be available in the store tomorrow 9/15.. Whoo Hooo!!! We hope you found some Favorites so far. Today we are introducing Newton's Costume Party and it's coordinating dies. This is one of those must have set for sure... How Fun to dress Newton up in all those costumes. Plus they don't have to be used for just Halloween. I dressed Newton up as a Unicorn and used a sentiment from the Believe in Unicorns set. I used some Fun pattern papers from Doodlebug Designs and a few Stitched Die cuts. 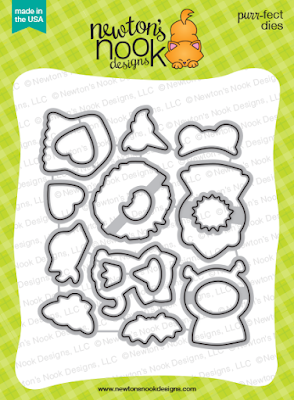 Would you like to win the “Newton's Costume Party” Stamp Set? This is TOO adorable!! I have a friend this card would be perfect for!! AWESOME idea!! Great idea to use the sentiment from the Unicorn set. I love the polka dots and non-Halloween design. LOVE LOVE LOVE this set and your card is so cute! This set is simply adorable! Darling card! 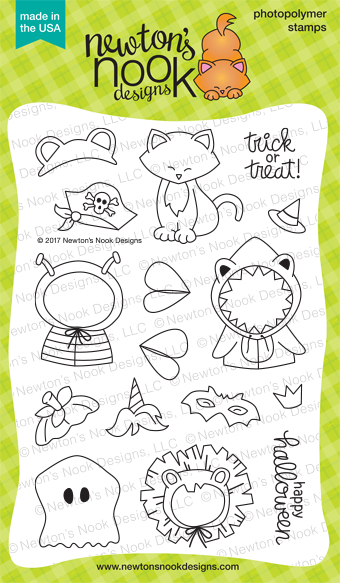 Love the cute Newton' Costume Party set and the fun sentiment you used! How sweet. I like that you showed this set can go beyond Halloween. What a cute card! This looks like it could be used for birthdays too, yea! Newton makes one cute little unicorn!! I love the unicorn kitty! 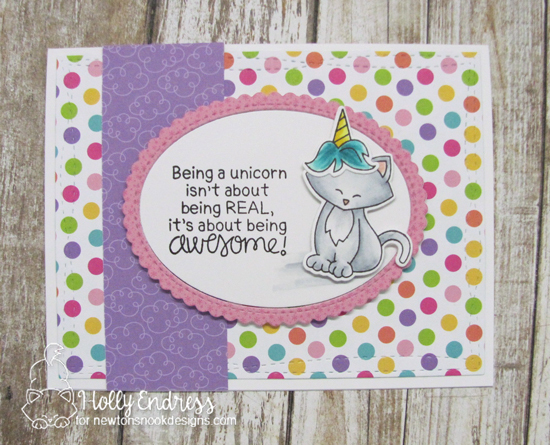 love the fun PP on this adorable card! Love the layout and bright colors of your unicorn Newton card! Such a cute card, love this new set from NND, love the non-traditional halloween colors! Oh wow, super sweet and super cute! I LOVE this card, sure bright, cheery colors, nicely done! Love this stamp set!Newton is my favorite stamp! and this is awesome! love it! 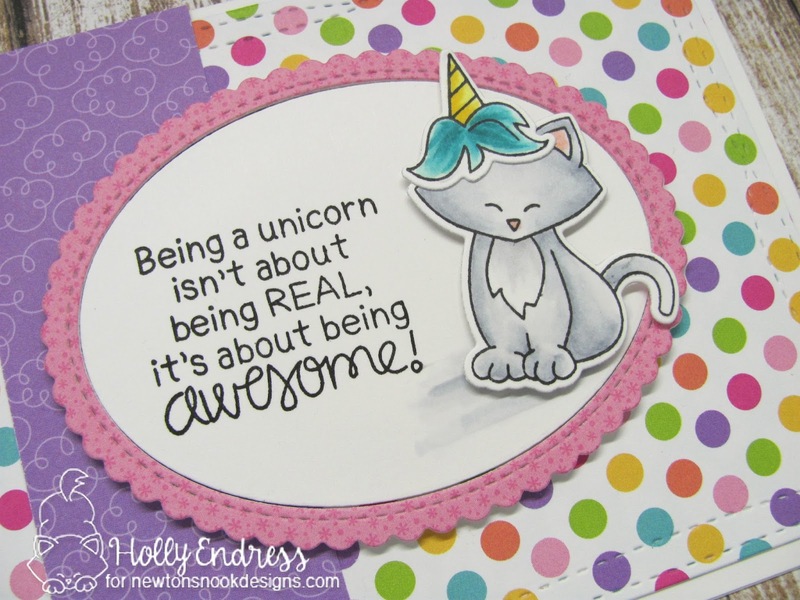 Love the phrase paired with the kitty dressed as a unicorn! The unicorn costume is just adorable. There are so many wonderful ones to choose from in this great set.